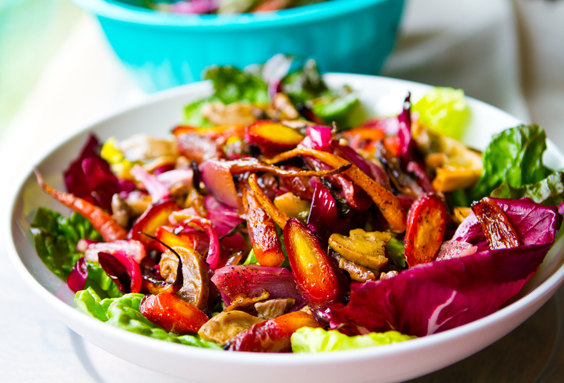 Chilled Veggie Salad. Rainbow Roast. 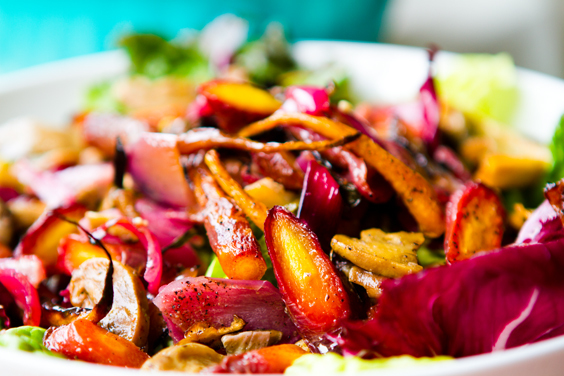 I'm reinventing the "chilled roasted veggie platter" via my Rainbow Roast Veggie Salad. 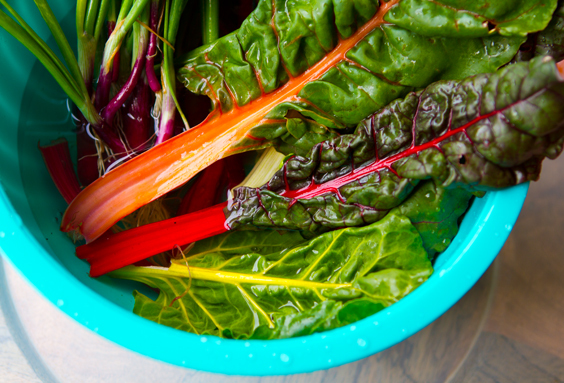 My secret ingredient: fresh farmer's market veggies in a rainbow of colors. Lemon. Herbs. 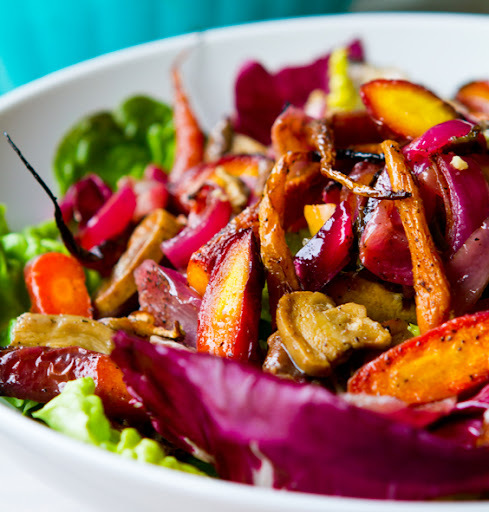 Mini red and gold carrots, exotic mushrooms, purple colored scallions and more accent this citrus-garlic roasted dish. Now, when I say "chilled roasted veggies." What comes to mind? For me, I imagine a luncheon. Business catering. Served inside a hotel or corporate conference room. As meal time dawns, a stream of black-tie waiters emerge carrying shiny faux-silver platters wrapped in plastic wrap. As the wrap is elegantly peeled away, colorful food awakens the gazes of the no-doubt very hungry diners, all clad in 3pm-wrinkled business wear. The eats: a few veggie and dip trays, the token meat-heavy sandwich platter, a fruit platter because it looks so pretty, some sort of creamy pasta dish, a big bowl of heavily dressed salad - Caesar most likely, and always, a chilled roasted veggie tray. Shiny red bell peppers cut into large planks, silky strips of black-lined grilled zucchini draped alongside slivers of purple-hued eggplant. Yup, this token "vegetarian" plate is usually simply referred to as the veggie platter. Roasted veggie sandwiches also make it onto many catering and room service menus. If you are vegetarian or vegan I'm sure you know this well! 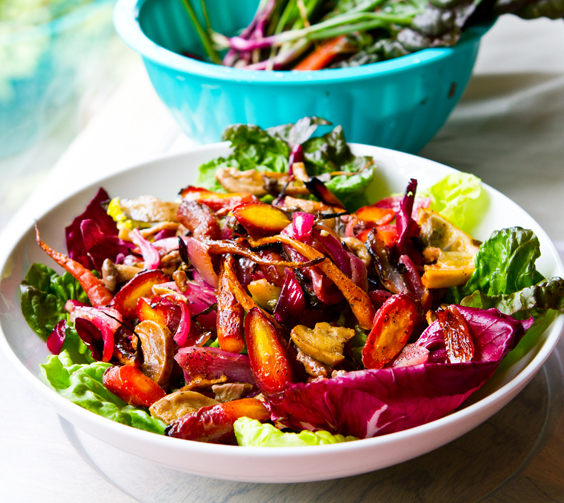 Mini red and gold carrots, bright red scallions, mixed mushrooms, lemon, garlic..
Best part: this salad looks fancy, but it is so easy! 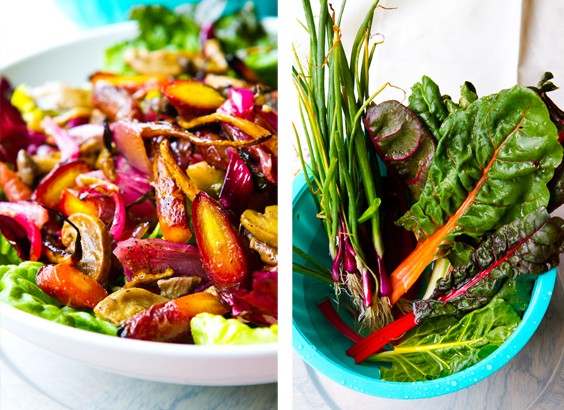 Simply roast your veggies the night before, chill in fridge overnight (let the flavors marinate the veggies even more) and the next day at lunch your salad will be ready and served in just a few minutes. for one baking-pan full of veggies I use about..
For the salad: greens, crunchy romaine and butter/crisp greens work best. 1. Prep your veggies by chopping off the stems and slicing into lovely cuts - easy for one bite in a salad. 2. 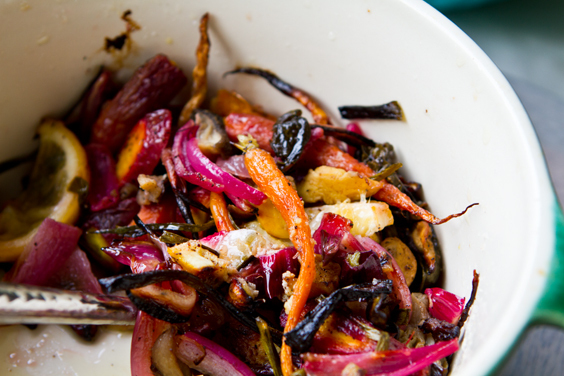 Add all your veggies in a large mixing bowl and toss with the roasting mixture accents. Coat each veggie well. 3. Add your veggies to a oiled baking sheet. 4. Roast at 400 degrees for 20 minutes - or until veggies are tender. I like to broil for about 1-2 minutes before removing from oven. 5. 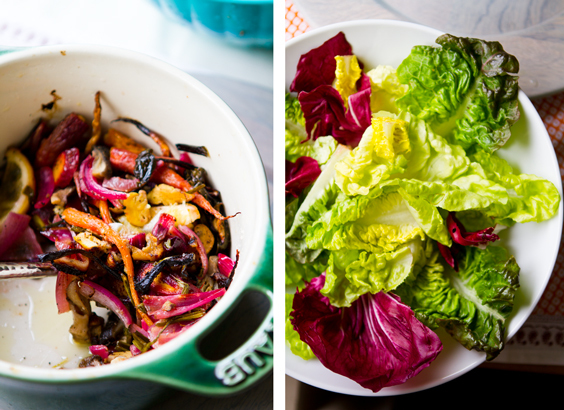 You could serve these veggies warm, but for the sake of our salad, we will chill them in the fridge overnight. 6. 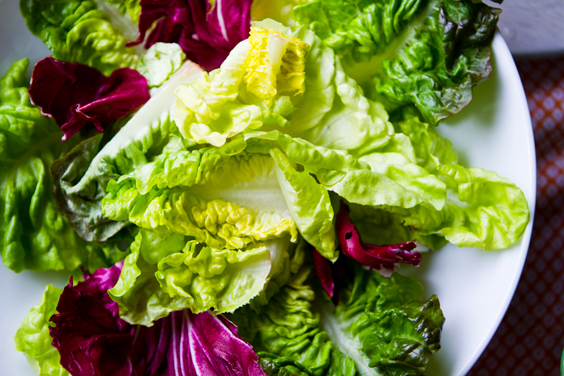 Assembly of salad: add a hearty layer of lettuce leaves to a wide-rimmed bowl. Then top with the veggies. 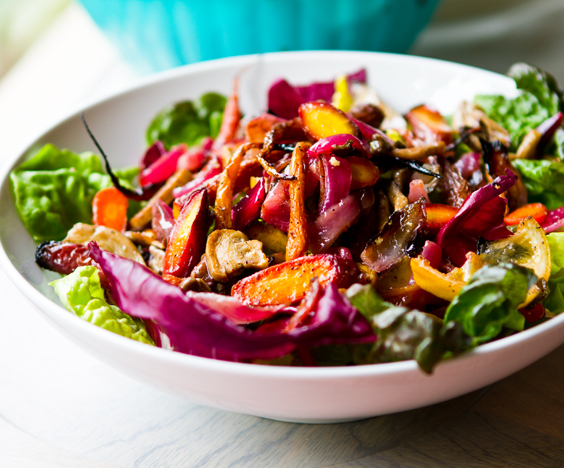 No additional dressing is needed since the veggies are so full of flavor from the oil and acids. (If you want added dressing, try a Dijon + maple + vinegar + oil dressing).